When searching for an office rental space in Charlotte, you probably have an idea in mind of what you’re looking for. Let’s say you’re a professional with a few fellow team members and a penchant for desktop computers. Your team loves to collaborate, and spends a fair amount of time on the phone. Your first instinct is probably to go for a private office. However, it’s important to be open to new ideas as you tour shared offices to rent. Perhaps because it’s the most traditional format, many companies believe they can only make do with a private office. The comfort, privacy, and design freedom of a private office are definitely appealing, but for most teams, they are not the only option. Dedicated desks are another option to consider, and work just as well for many organizations. Below are a few touch points that should help you decide between a private office or dedicated desks for you or your company. 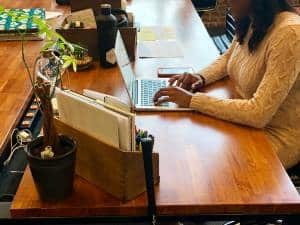 Every coworking space is different, and offer different features alongside their private office or dedicated desk offerings. Community managers can expand upon all those details for you, and have the knowledge and experience to help you make the best choice. Really, teams of all sizes could utilize both private offices and dedicated desks. This is more a question to consider prior to touring coworking spaces, as it will save you time to make sure a space can accommodate your quantity of team members before a tour. One thing to keep in mind is that your team members will be anything but comfortable crammed into a too-small office. If a coworking space does not have a private office large enough for your team, a cluster of dedicated desks (or even splitting the group between an office and desks) is a better choice- everyone needs breathing room. Everyone yelling on the phone like it’s a Wall Street trading floor? Probably private office material. However, normal levels of collaboration, chatting, and phone calls are usually fine in the dedicated desk and collaborative spaces of a shared office. There are a few types of professionals/companies for whom a private office is truly necessary. If the nature of your work is confidential (therapist, financial advisor, lawyer, etc.) a private space is probably optimal for your team and clients’ comfort. If those private conversations are rarer, your team can utilize dedicated desk coworking and use private spaces like the conference room or telephone booths for sensitive material. As mentioned earlier, one of the great things about dedicated desk coworking is that you can leave all of your stuff every night, and that includes desktop computers, printers, shredders, etc. If running your business requires more extensive machinery, tools, or materials, a private office will provide more space and storage options. Ditto if your materials are messy or loud (if you’re, say, an artist or sculptor). Again, community managers are a great resource to help you choose which level of membership is right for you. Click the link below to book a tour at The Launch Factory and check out our private offices, dedicated desks, and awesome coworking community!